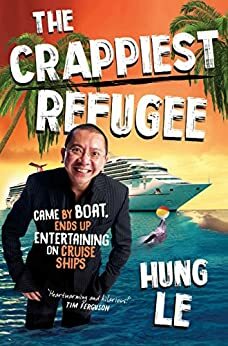 On the last day of the Vietnam War, nine-year-old Hung jumped on a leaking prawn trawler on the Saigon River, somehow cheating death to become one of the first Vietnamese boat people to arrive Australia, a land where a young man's potential is limited only by his imagination – that is unless you're Hung Le. Defying the stereotype, Hung wasn't a math or computer whizz, he had no doctoring or lawyering abilities, spoke Vietnamese with an Australian accent, and couldn't even play the violin. But what he was blessed with was funny bones, and through winning Red Faces on Hey Hey It's Saturday he managed to make an international career playing the violin out of tune. The Crappiest Refugee is an hilarious and endearing memoir about a boat person who never found his land legs, but who has always seen the funny side. Hung Le is a violinist turned comedian who first made his mark in 1987 as the winner of Hey Hey It's Saturday's Red Faces (Australia's top rating national variety show). Since then he has appeared at numerous comedy festivals and venues both here and overseas. The Vietnamese-born performer, now based in Melbourne, has made documentaries for the ABC, SBS and Discovery Channel and appeared in films including The Wogboy, Fat Pizza and Broken Hill.